On 11th September 2017 Gurkha trainees were assigned their capbadges at a parade at the Gurkha Training Company located at the Infantry Training Centre in Catterick. This is a very proud and important day for the Trainees and the Gurkha family. 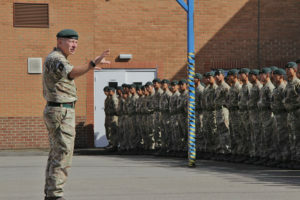 Senior representatives from each of the Gurkha capbadges and units were present, along with Colonel Brigade of Gurkhas, to personally congratulate the young trainees on their assignments to either; one of the two Battalions of the Royal Gurkha Rifles, Queen’s Gurkha Signals, Queen’s Gurkha Engineers, Gurkha Staff and Personnel Support, the Queen’s Own Gurkha Logistic Regiment or the Band of the Brigade of Gurkhas. The trainees still have some weeks to go until they pass out of the Training company and join their units later this year. Seven months into their nine month journey in becoming a British Army Gurkha, the 271 Trainee Riflemen discovered the Regiment or Battalion they will be joining in November. This milestone is key and they now all can start to understand how they fit into the Gurkha Family and the type of roles they will be taking on when they finish in Catterick. They arrived in the UK at the start of 2017 and will have completed nine months hard training on the way to becoming a Gurkha in the British Army including; military skills and tactics, survival skills, weapon handing skills, fitness, drill, English language training and cultural awareness. They all have a very important part to play in the British Army and will have the same opportunities as their British counterparts as their careers develop. We wish them well in the final few weeks of training.